Internationally acclaimed opera singer Pavlo Hunka was born in England, the son of a Ukrainian father and an English mother. He qualified as a linguist and then practised as a lawyer in the United Kingdom for four years before embarking on a stellar singing career. He began his vocal studies at the Royal Northern College of Music in Manchester and completed them in Switzerland with Kammersängerin Maria Sandulescu. Pavlo began his operatic journey in Basel, Switzerland, where he sang many of the bass-baritone roles in the Russian, German, French, and Italian repertoires. For the last 27 years, he has sung in the most prestigious opera houses of the world: Paris, Vienna, Munich, Florence, Amsterdam, Madrid, Moscow, London, Salzburg, Rome, Berlin, and Toronto, under a glittering array of conductors: Claudio Abbado, Jeffrey Tate, Semion Bychkov, Zubin Mehta, Peter Schneider, Mark Wigglesworth, Sir Simon Rattle, Sir Mark Elder, Daniel Barenboim, Esa-Pekka Salonen, Kirill Petrenko, and Kasushi Ono. Highlights include Don Pizarro in Fidelio at Munich and Vienna State Operas, the title role in Wozzeck at the Maggio Musicale in Florence, Doctor in Wozzeck at the State Opera in Berlin, Schigolch in Lulu in Brussels and Munich, Macbeth in Berlin, Falstaff at the Canadian Opera Company, Tomski in Pique Dame at Teatro Real Madrid, Klingsor in Parsifal and Hunding in Walküre at the Bolshoi in Moscow, Alberich in Siegfried in Lyon, Nekrotzar in Le Grand Macabre in Brussels, the General in Prokoffiev’s The Gambler in Amsterdam, Simone in The Florentine Tragedy in Geneva, Boris in Lady Macbeth of Mtsensk in London, Šiškov in From the House of the Dead in Berlin in the acclaimed Patrice Chéreau production with Sir Simon Rattle. Future projects include Dikoj in Katja Kabanova, Amfortas and Klingsor in Parsifal in Budapest, Tsar Dodon in Rimsky-Korsakov’s The Golden Cockerel, the world premiere of The Monster in the Maze by Jonathan Dove with the Berlin Philharmonic, the Ring Cycle in Denmark with Alexandr Vedernikov, Le Grand Macabre with Sir Simon Rattle and the London Symphony. 2016 marked Pavlo’s premiere performance in Ukraine, with an art song recital on June 5 at the National Philharmonic in Kyiv and another on June 9 at the Lviv Philharmonic. Pavlo produced and appeared in the September 29 concert in Kyiv commemorating the 75th anniversary of the Babyn Yar Holocaust. On October 4, he was invested as Doctoris Honoris Causa at the National Academy of Music in Lviv. Pavlo is Artistic Director of the Ukrainian Art Song Project (www.ukrainianartsong.ca), which has the goal of recording an anthology of over 1000 Ukrainian classical art songs by 26 Ukrainian composers – songs never heard by the world; songs that deserve to be performed on the world stage. Albert Krywolt is one of Canada’s foremost collaborative pianists. His career as a vocal coach and musician in opera and art song spans more than four decades, working with some of the world’s greatest classical singers on the national and international stage. As resident music director of the Edmonton Opera Association, followed by 28 years as music staff and Chief Coach with the Canadian Opera Company, plus numerous independent projects, Albert worked with Dame Joan Sutherland, Maureen Forrester, Ben Heppner, Sondra Radvanovsky, and Adrianne Pieczonka, among many other eminent artists. Career highlights include serving as head coach for Wagner’s Ring cycle for the Canadian Opera Company's inaugural season in its new house, the Four Seasons Centre for the Performing Arts in Toronto in 2006; touring with COC productions to the Brooklyn Academy of Music, New York City, and the Edinburgh, Melbourne, and Hong Kong International Festivals; and guest coaching for Pittsburgh Opera and Spoleto Festival USA. For the past decade, Albert has been the lead collaborative pianist for the Ukrainian Art Song Project, a multi-year international research, performance, and recording initiative led by British bass-baritone Pavlo Hunka. With UASP he has recorded more than 250 works composed by Liudkevych, Lysenko, Stepovyi, Stetsenko, and Turkewich, performed by Hunka and leading Canadian artists including Isabel Bayrakdarian, Russell Braun, and Krisztina Szabó. Albert played for both UASP Koerner Hall gala performances of Lysenko and The Galicians, and premiered Shevchenko and Shakespeare with Pavlo Hunka at Harvard University in Boston and at the Ukrainian Institute of America in New York City. Melanie Turgeon is Associate Professor of Music and Choral Director at The King’s University in Edmonton, Alberta. She has conducted numerous choirs and ensembles and has presented research at several academic institutions and conferences both in Canada and internationally. She has toured extensively with her choirs, including two very successful European tours. In addition to her role at King’s, Melanie is a member of the Eparchial Liturgical Commission, where she is responsible for the incorporation of liturgical music and texts into various publications for the Ukrainian Catholic Church. She has organized and taught workshops for educating cantors and has created several resources and publications for this purpose. Since 2002, she has served as Music Director and Cantor at St. Josaphat Ukrainian Catholic Cathedral in Edmonton. Highlights in Melanie’s research endeavours include the publication of a book titled Composing the Sacred in Soviet and Post-Soviet Russia (2008), and a hymnal with an accompanying five-CD set, Sing to our God (2008). She has also released three recordings with Heruvymy Ukrainian Female Quartet and one with King’s Choirs, titled The Voice of My Prayer (2011). In 2010 she founded Kappella Kyrie, an auditioned choir primarily devoted to Slavic sacred music. Melanie is honoured to have gained national recognition with Kappella Kyrie in the 2015 Choral Canada National Competition by placing 2nd in the Pan-Cultural Traditions Category. Her most recent research endeavour is Ukrainian Voices: Music of a Nation. In collaboration with Artistic Director and Co-founder, Mark Bailey of Yale University, Melanie is the Associate Project Director of Ukrainian Voices. 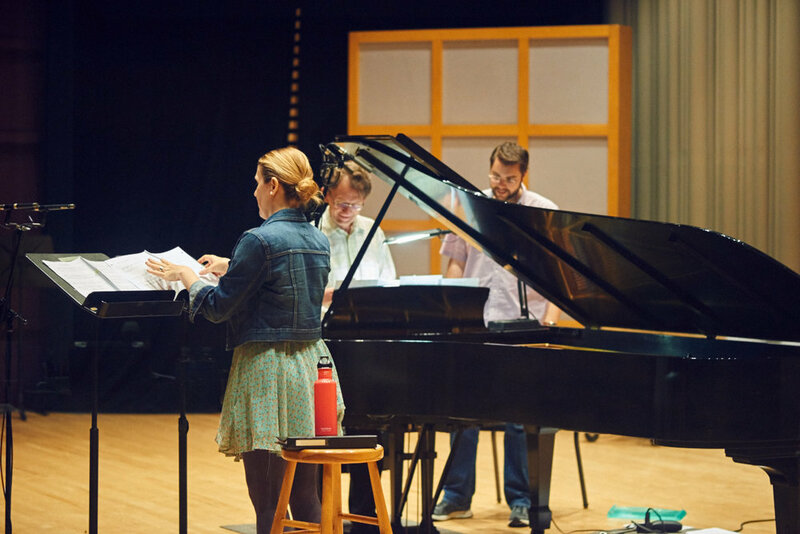 Through performances, recordings, scholarship, and publications, Ukrainian Voices brings awareness, knowledge, and accessibility to the music of various cherished and celebrated Ukrainian composers from the 17th to the early 19th century. Melanie has been involved with the Ukrainian Art Song Project for several years and she is most excited to participate in Summer Institute 2019. Pianist Robert Kortgaard was born in Regina, Saskatchewan and grew up in Calgary, Alberta. He completed his Bachelor and Master’s degrees at the Juilliard School in New York City. As a recipient of arts awards from the Canada Council, he furthered his musical studies in Italy and England. Robert has performed as a soloist with major Canadian orchestras and has given recitals throughout Canada and the United States, as well as in England, Finland, Portugal, Italy, Indonesia, the Czech Republic, China, and Japan. He is a favorite collaborator of many of Canada’s finest instrumental soloists, vocalists and chamber groups. His performances are frequently heard on CBC Radio and he has recorded for the Centrediscs, Marquis Classics/EMI, CBC Records, Teldec, and ATMA Classique labels. Robert is Artistic Director of the Indian River Festival on Prince Edward Island (recently nominated “Event of the Year” by the East Coast Music Awards), and the Leith Summer Music Festival in Ontario. He was musician-in-residence at the University of New Brunswick from l993-l998 and has given piano masterclasses at universities and festivals in Canada, Indonesia, and China and served as an adjudicator at many national music competitions. Robert has performed with sopranos Isabel Bayrakdarian, Sumi Jo, Jane Archibald, Adrianne Pieczonka, and Measha Brueggergosman, mezzo-soprano Susan Platts, violinist Joshua Bell, and prima ballerina Veronica Tennant on a production titled “Invitation to the Dance.” He has recorded French and German Cabaret programmes with mezzo-soprano Jean Stilwell for CBC Records. His CD with soprano Wendy Nielsen was nominated for both Juno and East Coast Music Awards. Robert tours with flutist Susan Hoeppner, cabaret artist Patricia O’Callaghan, baritone Brett Polegato, renowned music theatre actress/singer Rebecca Caine, and piano duo partner Peter Tiefenbach. A CD of the music of Olivier Messiaen, recorded with soprano Suzie LeBlanc, was released on the ATMA Classiques label and has received an Opus Award for best recording of 20th century music.